A year ago, I've acquired this blush on from ZA called ZA blush vibrante as an award. The award is for having a pearly white smile. Ahaha! I'm just so happy that day that I keep on smiling, little did I know that it's part of a prizes category. Actually they awarded me with a makeup set and this blush is just part it. It look me a year to use this blush on because during that time I'm still using up The Body Shop's Baked to Last Blush in Petal for my everyday look. Yeah, I'm one who wants to maximise the use of a beauty product before moving on to another one to avoid expiration dates. Once it's opened the clock starts ticking. Check out my previous post Makeup Expiration. I don't know maybe it's just me or perhaps my way of thinking. 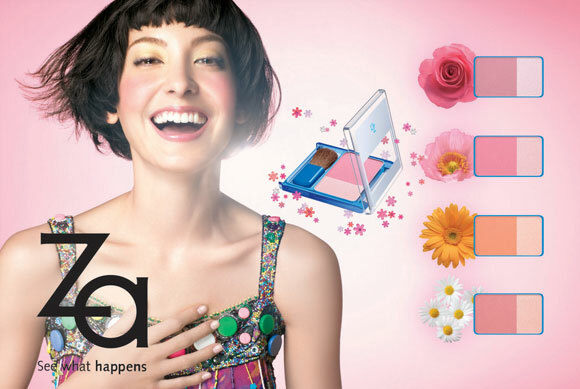 ZA Blush Vibrante "A versatile blusher compact that enhances your cheeks, or acts as an all-over face highlighter. The combination of matte and shimmer textures offers you the choice of a natural look or a glistening glow for more impact." ZA Blush Vibrante is a duo blusher. One side is for the blush on and the other side is for the highlighter. It is sold in 4 colors and I had mine in pink which I totally adore. Affordable. This blusher can be found on drugstore counters, so you get the idea. It's a duo blusher. One side is the blush and the other side is the highlighter. So if you want to add some shimmer on your blush you can mix it together with the the highlighter which can also be use to highlight your nose bridge and specific areas on your face. It's matte! Perfect for an everyday look. It doesn't break me out. Note: I have a combination skin. The shimmer has subtle shimmers which I find really good especially for everyday use because I like to mix my blusher with the highlighter. Long lasting. I don't usually reapply so I'm surprised that it last me from 9am till night. It's not very pigmented so you may have to reapply it a few times. I mostly have praises for this blusher from ZA. I love how au naturel it looks on my face. Feels like I don't apply a blusher at all. I would totally recommend. You might want to check them out at http://www.za-cosmetics.com/.